Just got this boat name request and need your help. Please read and submit you boat name ideas below! My husband decided that if he couldn’t have a Corvette for his 40th, then he wanted a boat. 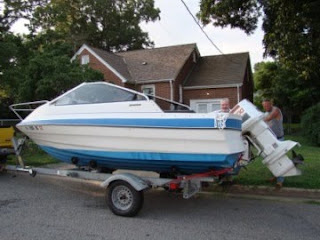 We started off small and his mom and dad bought a 17 ft Bayliner. Three days later and still no name, I stated to my mother-in-law "I know technically this is your boat…" She quickly responds, "no it's a we boat". Every one yells that’s the name. Are 17ft Bayliner is now "WEE BOAT". A play on "Wee Hours". Also, "Happy Ours" is traditionally one of the most popular boat names, but I don't think "Wee Ours" is used much and couldn't be more appropriate. Also, reinforces the "We" vs. "Your" thing.